In India, an individual’s income is taxed at graduated rates, depending on his/her duration of stay in India and income level. Non-employment income is taxed at a variable rate according to income type. In this article, we outline the rates and calculation methods for both income sources, and summarize common deductions and inclusions in income for expatriates working in India. Foreign companies establishing a presence in India will encounter a host of considerations that do not exist in their home country. Of these, interpreting and understanding India’s idiosyncratic system of accounting standards can be an especially difficult challenge. Until recently, India, like many countries in Asia, employed an antiquated set of generally accepted accounting principles (GAAP) that often proved difficult for foreign firms to adhere to. In order to have these standards converge more closely with international financial reporting standards (IFRS), the Institute of Chartered Accountants in India (ICAI) set out to introduce a new system, called simply Indian Accounting Standards (Ind-AS). The first phase of Ind-AS was implemented in April 2011 and introduced a total of 35 new accounting standards, including ones on income taxes, impairment of assets and statements of cash flows. Subsequent phases were implemented in April 2013 and April 2014. 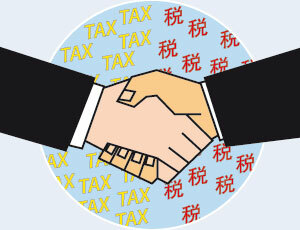 The International Monetary Fund (IMF) has lent its full support to Bangladesh’s new system of value-added tax (VAT). Following an IMF mission led by Rodrigo Cubero to the country, the IMF said that the tax will help boost revenue and reduce compliance costs for businesses. The IMF’s remarks arrive on the back of fresh concern from Bangladesh’s business community over the impact the new VAT will have on business operations. The new system will now introduce a single, uniform VAT rate of 15 percent instead of multiple rates – an outcome that has been strongly opposed for some time. The fear from Bangladesh’s business community is that the flat VAT rate will be suitable for large, wealthy corporations, but may be harmful for small and medium enterprises (SMEs). A non-uniform VAT is widely seen as a fairer all-round system. When combined with aggressive tax planning, Hong Kong’s onshore-offshore tax regime often results in a reduced tax burden for taxpayers that operate through Hong Kong companies by pricing intra-group transactions. This has led to heightened transfer pricing scrutiny from the Hong Kong Inland Revenue Department in recent years. In order to provide clarity to taxpayers operating in Hong Kong on the appropriate manner in which intragroup transactions should be priced, the Inland Revenue Department released its transfer pricing guidelines in 2009. This was followed by the introduction of the Advance Pricing Arrangement (APA) program in 2012. A withholding tax is a tax that is kept back from an employee’s salary and subsequently paid directly to the government. Withholding taxes are commonly employed by countries throughout the world to help combat tax evasion. Countries in Asia typically divide withholding tax into dividends, interest and royalties payments, with the amount of each varying considerably in each country. India, for instance, does not have any withholding tax on dividends, but has a 20 percent tax on royalties. Here, we provide a chart comparing the three withholding tax rates of China, India, Hong Kong, and the ten nations of ASEAN. The corporate income tax rates of Asia have fluctuated considerably over the past two decades, and more change is forecast for the future. In China, the CIT rate has decreased from 33 percent in 2007 to its current 25 percent, and Indonesia’s has decreased twice since 2007. Vietnam’s rate has changed from 28 percent in 2008 to 25 percent in 2012 and 22 percent in 2014, and the country’s government has already announced its intention to alter the rate once more to 20 percent in 2016. Malaysia, the Philippines, Thailand, and the majority of the other countries in the the Association of Southeast Asian Nations (ASEAN) have experienced a similar downward turn in CIT rates over the past several years. This points to a trend in emerging Asia – particularly in the East and Southeast – towards legislating a lower rate of corporate taxation, indicating that the governments of each are beginning to focus more on securing investment than on subsidizing state spending. That being said, there is still a sizable gap between the rates of CIT in Asia, with the highest more than doubling that of the lowest. Here, we provide a visual representation of the CIT of India, China, Hong Kong, and the ten member states of ASEAN. As the economies of emerging Asia continue to develop, the region’s tax rates are becoming increasingly influential. From the perspective of Asia’s governments, taxes can be used to either ensure that investments flow in to their own jurisdiction, or as a means to subsidize government spending. Conversely, from the standpoint of companies and individual wage earners, they can help determine whether a particular jurisdiction suits their business model and occupation. There are numerous taxes which will be applicable for foreign businesses and wage earners in Asia, including corporate income tax (CIT), individual income tax (IIT), withholding tax, and indirect taxes such as value added tax (VAT) and goods and services tax (GST). Understanding how these various taxes function is integral both for companies wishing to access Asia’s emerging markets, and individuals looking to work in the region. In this excerpt from our latest Asia Briefing magazine, we provide an introduction to Asia’s rates of taxation. We explain what these taxes are, briefly discuss how they apply to Asia, and conclude by taking a look at how Asia’s countries compare in the World Bank’s latest ease of paying taxes rankings. 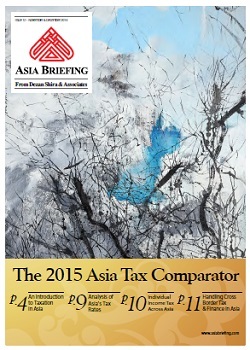 The newest issue of Asia Briefing magazine, titled “The 2015 Asia Tax Comparator“, is out now and available as a complimentary download in the Asia Briefing Bookstore. Over the past month, a number of new tax laws have either been implemented or are in the process of being implemented in several key Asian nations. These policies have been variously aimed at attracting foreign investment, improving economic performance levels and reducing fiscal deficits. In Asia, tax changes are invariably acutely felt by businesses with a stake in the country in question, and will always partly inform the future investor outlook of that country. In this article, we take a look at some of the key policy changes that have taken place.